Knowing how to bridle a horse well is crucial to laying a trusting foundation for the rest of the schooling session. All horses who have already done a bit of work know exactly what the tack signifies, and as horses seem to be particularly good at making associations, good and bad, it is definitely in our interests to make sure as far as we can that associations with the bridle (and saddle of course) are positive. Of course this is not always within our power, often we are working with horses with unknown or unfortunate history's, but it is encouraging just how possible it is to reform negative associations. Prevention is always better than cure however, and if we consider learning how to bridle a horse nicely as our responsibility, which does not require certain 'good behaviour' on the part of our horse, then we will be more likely to develop a sympathetic and intelligent approach. After all, why should it be our 'right' to ride a horse? We will make a big difference if we appreciate the gift horses give us when they accept our control over them. If you are fortunate enough to be able to build positive associations from the very beginning with a young horse, by the time you come to introducing tack, there is rarely any question of lack of trust. Develop a state of mind around your horse similar to how you feel in a meditation (don't go away if the word meditation is off-putting for you, it's only a negative association - you can change it!!). Focusing on the present moment for a few minutes, maybe by being aware of your breathing or how you feel in your body, will lower your energetic vibration and calm your horse. To encourage yourself in this do everything with a particular care and attention and maybe a little bit more slowly than normal. Remember you are the leader. You decide what is dangerous and what is OK for your horse, and if the horse is going to listen to your opinion, you must firstly have an opinion, which will be evident by the deliberate, calm way you are doing things, and secondly you must back up your opinion with sympathetic responses to the reactions of your horse. Remember that there is nothing horses have less respect for than hesitation and lack of self-belief. As a leader you take responsibility for the whole herd, and they are entrusting their lives to you. This may seem a bit dramatic, but it's just how it works. As soon as you ask anything at all from your horse, you are asking for their compliance and you are therefore assuming the leadership role. These roles are not set in stone either. Every gesture you make is evaluated by your horse and a decision is made on whether you are a suitable leader or not. If you have decided in your own mind that you are willing to take that role, your body language will be in alignment with this and you won't have to analyze everything you do. That doesn't mean you can't be a better and better leader every day. Remember leadership doesn't mean dictatorship - true leadership can only be founded on genuine love for your horse. Understanding how to bridle a horse well matters because it is particularly symbolic of the control we have assumed over our horses lives. We are putting a bar of metal in their mouths and they are expected to trust us with that power. They understand the significance of this, and so must we. Many people love their horses but are not willing to assume the responsibility of leadership. A sentimental love of this kind could be considered unjust. If we are willing to take a horse out of the environment they are able to be independent from humans in, and force them to rely on us, then we have to make very sure that someone is being leader. Without a leader a horse can never fully relax, unless of course they are assuming the role themselves, which is fine as long as they have the resources available and they are not contradicted. On the other hand, people who do not put their horses first because they are choosing to exploit them for any reason, and they have not found it in themselves to love them, will not win the trust which has the power to dissolve all boundaries. Rafael (right) has much higher levels of testosterone than a normal gelding (he has a retained testicle), and he naturally assumes the leadership role. This tendency, coupled with lack of education, led him into a lot of trouble with people in his past. It was only the fact that his well-being was put first at HHT that has allowed us to gain his trust enough for him to relinquish the leadership role and allow himself to be handled and ridden close to and amongst other horses in safety. He knows we love him, so he can relax and give over the control for as long as he is with us. In his own herd he is responsible for the others, and that is natural and right for him. 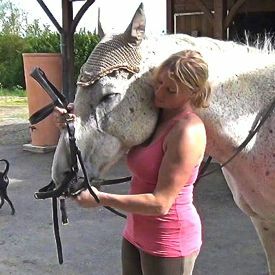 Grooming is what horses do to bond with each other as well as lift out the dead hairs etc. It is a pastime which is enjoyed when the herd is calm and enjoying each others company. 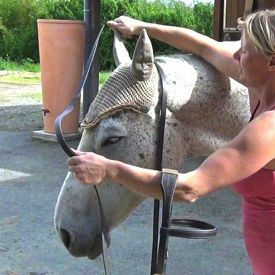 Whether you're learning how to bridle a horse yourself, or introducing a horse to being bridled, you can benefit from this by introducing yourself to the horse through grooming, and the first association the horse will therefore make is that you are benevolent and interested in improving his well being. Make sure that it is actually an enjoyable experience for the horse. Some horses, especially mares can be extremely sensitive in their skin. We find that this hyper-sensitivity reduces over time as their training progresses and their health improves, it can be related to hormone imbalance or spinal issues. Sensitivity does need to be respected, and it is important to find the right grooming tools. 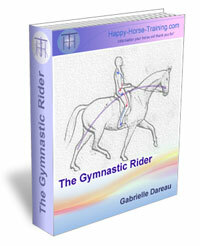 You can view it as a challenge, how much you can relax your horse by being delicate and sensitive. Use your intuition to find the touch your horse finds relaxing or at least acceptable. When your horse is groomed and as relaxed as possible the tack can be introduced. Watch your horse's eye to help you stay in touch with his feelings about the equipment. If he goes blank that indicates some level of past trauma. In this case take as much time as it takes to bring the horse back into the present. If he stays 'with you' but looks scared, let him look at the bridle and smell it and be patient with him until he relaxes again. How To Bridle A Horse Step 1) First prepare the bridle by undoing the noseband and throat-latch if they are buckled up, and making sure the reins are untwisted. Tack is more comfortable for your horse if it is clean and supple. Check the stitching is in good repair, and the leather isn't too cracked or stretched. If you are not sure of the height of the bit you can make a rough estimate by measuring the bridle against the horses head before you put it on, leave the cheek piece buckles undone, and opt for too long rather than too short so that you can adjust it without hurting the horse. How To Bridle A Horse Step 2) Holding the bridle with your left hand, put the reins gently over the horse's head with your right hand. If you are too small to reach in relation to your horse it is better to stand on something rather than to try to chuck them over. 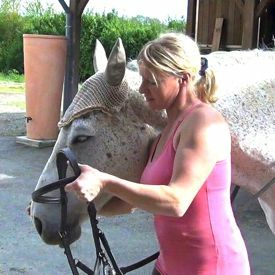 How To Bridle A Horse Step 3) Standing at your horse's left shoulder facing the front, put your right hand under the neck and round the front of the horse's nose. Then pass the bridle from your left into your right hand, holding it about halfway up the cheek-pieces. Do this carefully so the horse doesn't back off. If he does, stay with him without spooking him. I prefer to bridle a horse untied rather than having the head-collar half done-up round his neck. Even just having the lead-rope through the string loop untied is safer than risking him panicking with the head-collar round his neck. If your horse is likely to make off in this situation he needs more preparatory work before introducing the bridle. 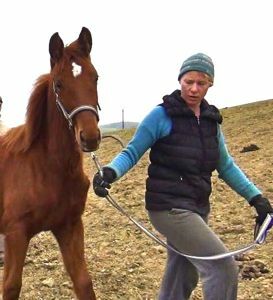 Now you can gently stabilize the horse's nose with your hand which is also holding the bridle, while you lift the bit up to the horse's mouth. 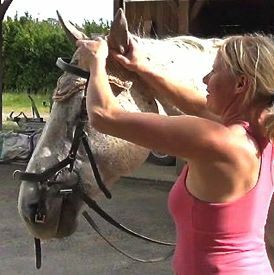 How To Bridle A Horse Step 4) When you bring the bit up to his mouth it is a very good idea to get him to take it as voluntarily possible, as long as you are sure that it fits him comfortably. While you hold the bit close to his mouth with your right hand, you can gently massage and play with his lips and gums with your free left hand. Don't try to pry the jaws apart or poke the gums, stay gentle, until he opens his mouth himself. When he does open his mouth lift the bridle up promptly but never abruptly and ease the bit inside. With a less willing horse they may only be a short window when the mouth is accepting the bit, so be ready to take your chance. As long as you are gentle you will upset the horse less by being efficient than being too slow. 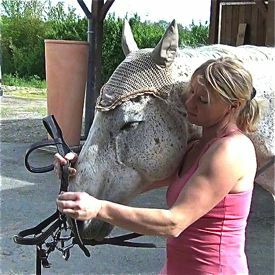 How To Bridle A Horse Step 5) The next stage is very important for encouraging confidence in the future. Keeping the bridle carefully supported to make sure the bit stays in the horse's mouth, swop it from your right hand to your left. This free's up your right hand to be able to take the off-side ear very entry with and ease it under the head-piece. Then you can lift the headpiece over the near-side ear with your left hand. 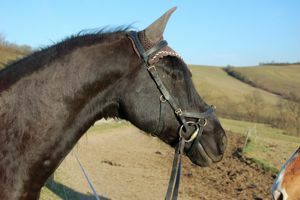 If the bridle turns out to be adjusted too short it will be difficult to get over the ears. Either you can take it off again or adjust it before you put the head-piece on which is a bit more tricky. There is nothing wrong with making the bridle longer until it's on and adjusting it then if your horse is sensitive in his ears. When it comes to how to bridle a horse without upsetting him, anything which avoids a struggle is a good idea! Stay patient and calm throughout. All horses can get to the stage of looking for and eagerly gobbling up their bit. they don't have to be a problem case for it to be worth the time either. It is good training in general handling technique for you and trust building between you and your horse. How To Bridle A Horse Step 6) When adjusting the throat-latch make sure you can get a fist in under the horse's jaw, and two fingers at least under the noseband. (The bridle illustrated is a Micklem Multibridle which doesn't have a throat-latch). At HHT we don't advocate the use of flash nosebands, grackles, double bridles and so on, so we don't advise on how to fit this equipment either. How To Bridle A Horse Step 7) When taking the bridle off, always undo the throat-latch and nose-band first, and make sure you don't try to take the bit out too quickly. Sometimes you might have to prevent the horse from pulling away and other times you might have to wait for him to let go. Either way it is important not to let the bit bang his teeth. Remember that practice makes everything much easier so don't worry if you are awkward at first. Horses are usually tolerant if you are nice to them! 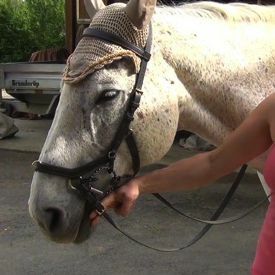 Horses may become difficult to bridle for many different reasons (discussed on bridle problems page), but in every case they have associated the bridle with fear and/or pain. The only way to change their neural patterning therefore is to help them to form new, positive, associations. This is why it is crucial to be calm, patient and affectionate every time the bridle is introduced to your horse. 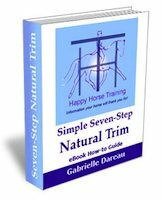 A horse who is nervous even when he sees a bridle at a distance would benefit from the Trauma Therapy technique 'working with threat' described in the Trauma Supplement offered free with the How to Train a Horse Without Force Part 1 ebook. 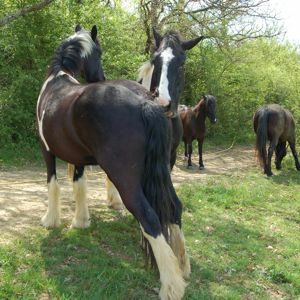 This technique describes why horses become traumatised, how to recognise the signs and what to do about it. 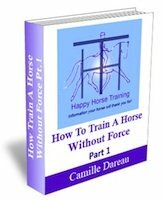 Firstly try to get to the bottom of why he is unhappy, if the source hasn't changed then there is no reason why he will feel better about accepting the bridle (see bridle problems). Use a rubber bit so that it doesn't bang the horse's teeth either going in or out of the mouth. 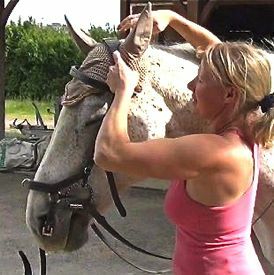 Practice with a bitless bridle until the horse accepts the headpiece being lifted over calmly. Don't try to do it all in one day. When it comes to how to bridle a horse who is difficult, little and often is far more effective at re-patterning because every time a horse remembers a good experience, which only happens after the experience, the positive memory strengthens. 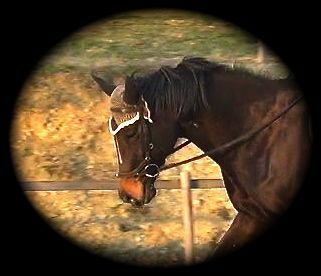 You can undo the cheek-piece and put the bridle on from the side rather than over the front, but remember that you are not trying to trick the horse or deceive him in any way. It is not helpful to think only about the fastest solution possible either. Give your horse all the time he needs and you will be re-paid in the future. Make sure the horse is happy before the bridle appears. This means that he has had enough exercise, he is not isolated from other horses, he is not hungry or thirsty or too hot or cold, or stressed for any other reason. The more favourable the situation, the calmer he will be to start with, and the better things will go. If he gets up high away from you, bring a stable box to stand on and slowly work your way up, massaging/scratching him gently until he lets you approach. Always wait until the horse has relaxed again before going a step further. Find an Equine Dentist you trust to make sure your horse is not in pain in his mouth. He will find it hard to trust you if he has pain which is unrecognised. Remember to go with your intuition and don't accept a diagnosis which goes against what you suspect. For many years I was told that one of my mares had a 'normal mouth' until we found an excellent dentist a few years ago who confirmed that she had a large hook growing down into her gum at the very back of her mouth. It must have been developing over the majority of her lifetime. Although she is not an easy character, she didn't make it clear by refusing her bridle, in fact she gobbled for the bit. The problem became more obvious in her ridden work.